A Perth analyst says 2018 will go down as the first time since mid-2012 that the majority of global nickel production became economic on a cash basis. Addressing the Paydirt 2018 Australian Nickel Conference in Perth today, Alto Capital senior analyst, Carey Smith, said the surprise outcome was best reflected in a poll conducted during this month’s London Metals Exchange (LME) week which identified nickel as the base metal with the greatest potential in 2019. “The quarterly average of nickel price and C1 costs has seen the nickel price finally rise above the 90th percentile of C1 costs,” Smith said. And the commodity’s production costs are only likely to increase going forward, as fuel and labour costs for example continue to rise. But margins have improved, allowing many mining projects to finally become economic along with improved consumption, with annual consumption growth between 2010 and 2018 averaging 5.8% per annum. The Alto principal said the nickel market however continued to evolve as a changing beast. The market changes also took into account the substantive increased production – in China and Indonesia particularly but also elsewhere – of nickel pig iron (NPI) which had seen NPI output rise from 25,000 t in 2006 to 650,000 t in 2018. Indonesia and China are expected to produce around 350,000 t of NPI, each, in 2020, even within tighter environmental regulations. China was further contributing to the changing global nickel market by halving nickel laterite imports between late in 2013 and mid 2017 – only to see China laterite port stocks double since March this year to around 14 Mt at an average grade of 0.8% Ni. In stainless steel, a key consumer of nickel, while China remained the dominate producer at over 60% of stainless steel production, environmental, cost pressures and cheaper imports were likely to restrain its future growth. This is benefitting Indonesia particularly which is becoming the “new force” in Asia in stainless steel market and would emerge over 2018 as the region’s largest stainless steel exporter. Smith cautioned against future stainless steel production, a sector he said continued to show strong growth but with production now at more than 50 Mt/y, risked the real possibility of over-supply. At the same conference, Independence Group (IGO), one of Australia’s most successful nickel producers, Managing Director, Peter Bradford also noted that decreasing stockpiles and growth in global stainless steel demand will move nickel prices higher as the commodity becomes the big winner from the electric vehicle demand disruption. Not only will that demand spurt require an additional 300,000 to 900,000 t of nickel within seven years, but it will also underpin a much stronger outlook over FY19 for IGO’s newest nickel mine, the Nova Operation in Western Australia’s Fraser Range (orebody shown in the picture). 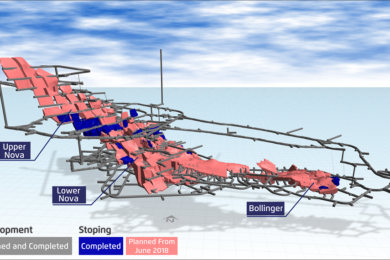 The Nova mining lease has been the subject of the largest 3D seismic program ever undertaken in Australia, with Bradford describing the Fraser Range as “extremely fertile”. IGO is currently undertaking downstream processing studies to further enhance value at Nova as well as further exploration in the Fraser Range of Western Australia, assigning a A$51 million exploration budget for FY19. The company is working to further evolve the downstream processing potential from its broader Nova assets, to produce nickel and cobalt sulphates for EV batteries. “This strategy can deliver IGO the potential for higher payability, premier prices and higher concentrator recoveries,” Bradford said.